Refined. Comfortable. Grown up. Any review of the 2017 MINI Clubman you read will include some variation of those adjectives. Yet there’s more to the Clubman than simply a larger more comfortable MINI. When MINI launched the first generation (new) Clubman in Monterey California back in 2008 it was the world’s first experience with what a larger MINI could be. Perhaps unsurprisingly it wasn’t all that different from what had been on dealer showrooms. Slightly longer with a small extra side door and a novel barn door set-up (mostly designed to elicit nostalgic thoughts) the first Clubman was a cautious attempt by MINI to broaden the brand’s appeal and ultimately sales. The problem was that the Clubman seemed a little odd. In some markets that side door was on the wrong side. In others it was too small (and had too many drawbacks) to go up against cheaper competition. While we thought it was an admirable compromise between space and performance, the vehicle’s sales made the point black and white that the public generally did not. After all this was basically just an R56 hatch stretched a foot between the wheels. Fast forward seven years and MINI is back with a new Clubman designed to right every wrong that the previous generation had and officially move it into the compact class of cars. And good timing as BMW’s own forecasts show that the compact segment (the previous Clubman was classified as a sub-compact) will make up 27% of the marketplace by 2020. So big is this change that MINI internally looks at the F55 four door hatch as the true R55 Clubman successor. In many senses this new Clubman represents an entirely new vehicle for the brand. Built upon the UKL2 platform (the same one the BMW X1 rides in), the Clubman benefits from an increase in size by providing dramatically more rear legroom and a much larger trunk. So how big is the new Clubman? This is the least mini a MINI has ever been. But considering the market it’s going after, it retains the typical MINI values. The MINI Clubman has 7.2 inches more rear seat legroom than a Mercedes CLA250, and has more headroom than both the CLA and the Audi A3. Yet at 3105 pounds, the MINI Cooper Clubman is lighter than an Audi A3 FWD. How does it compare to other MINI models? As you can see above it’s both the longest and the widest MINI ever, but just barely larger than a VW Golf and only because while MINI USA counts the license plate bracket, VW does not. But MINIs are meant to be mini. Can they create a new, larger Clubman while staying true to the brand’s ethos? Let’s find out. Our morning was spent with a Melting Silver Clubman Cooper S manual and our afternoon with a Pure Burgundy Cooper S automatic. Our route followed a mix of open highways and back roads along the Georgia coast down to Jekyll Island, which offered up a look at real-world driving. Not just idyllic twisties but long straights and plenty of in-town stop and go. From a driving perspective however it’s where the wheels are placed that’s particularly interesting. With a longer wheelbase, the Clubman has by far the most comfortable and controlled ride we’ve ever felt in a MINI. Driving the car on old Georgia highways in comfort mode, expansion joints almost disappeared entirely. Likewise the wider track contributes to this more grown-up feel by increasing the stability of the car at highway speeds. All told this is by far MINI’s best highway cruiser. All well and good but MINIs aren’t intended to be driven in a straight line. Frankly that’s where things get interesting. Coming from a F56 Cooper S, I can certainly attest to the fact that you feel the extra heft of the Clubman in the wheel and under foot. Unsurprisingly the Clubman doesn’t feel quite as nimble or as fast as the 350 lbs lighter MINI hatch. As much as BMW and MINI engineers seem like miracle workers at times, a 350 lbs weight gain is impossible to hide. So instead of hiding it, MINI’s chassis engineers (working everywhere from the Nurburging to the public roads of Wales) focused on creating a subtly different character for the Clubman than the two door MINI. With the wheelbase helping to relax the highway ride, MINI also tweaked the spring rates to give the car a slightly more supple feel. But in this case making a car softer doesn’t result in less fun. The Clubman transitions from corner to corner smoother and more progressively than the hatch. Engineers have created a balance with the Clubman that we’ve never seen in a MINI before. Even when pushed hard the car responds with composure by gently oversteering into a four wheel drifting rather than plowing as smaller MINIs are prone to do. Sounds grown-up right? There’s really no better way to describe it. Yet the Clubman never feels slow or boring in Cooper S form. The Clubman’s turn-in is crisp and full of the feel that all of MINI F-Series cars have been imbued with, making it fun to drive in a less frenetic way than the hatch (or even F55 four door). We found MINI’s standard suspension (there is no passive Sport suspension offered) to be a good mix of performance and comfort. However we would highly recommend the optional variable dampers that allow for both comfort and sport settings. In fact an option like this really makes much more sense in a larger more premium product like the Clubman where a buyer might have more varied needs – hauling kids one moment and hitting the curves the next. If you’re worried that the extra weight and size makes the Clubman less exciting, opt for the manual. We drove both the manual and new 8 speed Aisin automatic back to back and found plenty to like in both. However the manual (perhaps unsurprisingly) cuts through some of the sophistication of the drivetrain and lets you plainly have more fun. It’s a known quantity given that it’s identical to what we’ve seen in the two door and four door hatch. Slick shifting with good (albeit light) clutch engagement, the manual rewards exactly how you hope it would. And with seamless rev-matching (something we’ve grown to appreciate despite our love for old-school rev-matching) it’s easy to live with as well. What of the new 8 speed automatic? 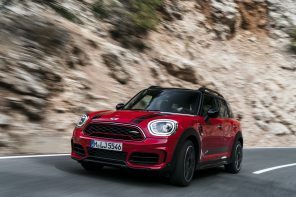 It’s MINI’s best auto yet with both wider and closer gear ratios than the 6AT that allows it to deliver improvements in both fuel efficiency and engine performance. How much of an improvement? We dug up a slide that Aisin used at symposium recently that summed it up. Shockingly it’s also slightly smaller than the 6 speed it replaces making it suitable even for the smaller MINIs (hint hint). The new 8AT is as efficient as the manual and quicker off the line. Downshifts are quick and the subtle rev-matching means that every gear change (no matter what the scenario) is as smooth as possible. To that point this new 8AT like most modern transmission will allow the drive to shift multiple gears at once. Simply hold the left paddle down and the transmission will automatically select the lowest gear possible – perfect in two lane passing situations. If you’re on the fence between the two we’d still recommend the manual. It’s more rewarding on the backroads and even easy to drive in traffic. But if you get an auto, rest assured MINI’s new 8 speed auto is just about the best there is in the world of front wheel drive cars. If you’re sensing an asterisk there you’re right. As good as it is, it’s still not quite as refined or quick as the ZF 8 speed BMW uses in its larger rear wheel drive based vehicles. The Clubman is as much a natural in the corners as it is hauling from Ikea. The rear seats are truly worthy of long trips for adults and the front seats are dramatically more comfortable than what MINI offers in the Countryman. And that boot. For a MINI, it’s huge at 17.5 ft and and 47.9 ft with the seats folded. And that’s without the impressive storage space below the floor (provided you don’t opt for the spare). So the Clubman is rewarding to drive and easy to live with. But the more immediately impressive thing about MINI’s new four door is how it looks and feels the moment you sit in the driver’s seat. MINI has made an effort to describe all of its cars (from the 2001 launch onward) as premium products. However the new Clubman may be the first model to truly live up to that word (or at the very least redefine it). From the cohesive design to the soft touch plastics, both Clubmans we tested (MSRPs ranging from $36k to 39k) felt worth every cent of their MSRPs – especially when looking at their competition. When MINI design began the F54 project in 2011, they started by trying to define the characteristics of the car. If the Clubman was a person, who would that person be? Head of MINI design Anders Warming thought of the Clubman has the guy at the party who was incredibly cultured (without being boastful), effortlessly funny (without being crass) and undeniably handsome. In short a gentleman. Through plenty of research and many brainstorms the persona stuck. The Clubman quickly became “The Gentleman” inside the halls of MINI and every decision that flowed from the sketchbooks mapped back to that idea. As Anders Warming conveyed, within the timeframe they were designing the Clubman there were plenty of moments they felt a little uncomfortable. But in those moments they knew they had something right. As he tells it, if you’re not entirely uncomfortable within the design process then you’re just complacent. Complacency isn’t necessarily bad. It sells a lot of similar looking cars. But MINI strove for something much harder with the Clubman. Their goal was to create a car that could appeal to a larger audience while staying true to the MINI spirit. Additionally they had the challenge of finding that sweet spot in design that reflects history and modernity. After a few days behind the wheel and studying every angle of MINI’s latest Clubman, it would appear they’ve accomplished both. The Clubman is a gentleman. But more importantly it’s still a MINI. It’s not as brash as the hatch nor does it try has hard as the Countryman. The Clubman feels carefully crafted with its own character befitting of a new segment and a new set of customer needs. The Clubman isn’t just a larger, heavier MINI. It’s the type of gentleman that that seems more interesting the more you get to know them. The Clubman doesn’t make you weak in the knees at first glance. But it endears itself to you the more you drive it and get to know it. A gentleman it is. Refined and grown-up just as we would have guessed it. Luckily none of it is at an the expense of fun. Scoring is within the context of the market and the MINI brand.